TS had made friends with the second wife of her third cousins, cousin’s friend whom owned the local tourist shop. She’d invited us to attend a late night candle lighting service at a private church not too far away. “Another Greek church – well you did promise an all round super authentic Greek island experience” I comment to TS as we all make our way to the pre-appointed meeting spot. “How long do we have to stay?” I whisper to TS, fearful of a recital of the Orthodox first testament all done in ancient Greek. We make our way up the mountain, over fields, round bends and over the hill. And that’s when we hear the music, the laughter and see the church doors open and 100 + very ‘happy’ religious patriots spilling out onto the street. Trestle tables fill every spare space and are heavy with large plates of meatballs, marinated artichoke, cheese fritters, fish pieces and bread. It’s explained that island custom dictates that every family chapel must throw a big party once a year. Everyone’s invited. (I love Greek Church!) And considering that there are over 700 chapels on the island, well you do the math. 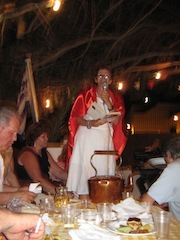 On most any night, in some village on the island, someone can be counted on to be swilling retsina wine and standing on tables making a speech. God Bless Tinos. 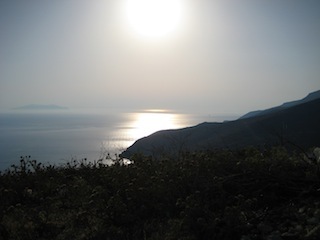 This particular church party is celebrating midsummer which you apparently do by going into the chapel, lighting a candle, having a quiet moment to yourself and then drinking tons and tons of home-made ouzo. A one-man band keeps it real with Greek favourites as we eat, drink and try to keep up with the flock. We make friends with the whole village and communicate by way of smiles, overt hand jesters and overt ouzo. And just about when you think you couldn’t be more blessed, they bring out The Chair of Fire. A large wooden chair is pulled out onto the street and set alight. 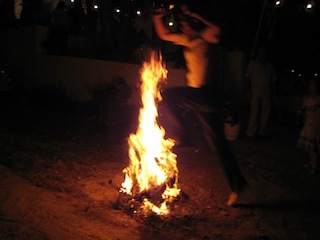 Based on an ancient midsummer tradition, by jumping over the flames you release the bad spirits of the previous year and can start the new one fresh. Everyone starts to jump over the roaring flames: the young men, old men, women and children. More chairs are brought out. The music gets louder. The Chair of Fire grows and grows. The Swedish Husband, whom I feel by this stage of the night should not be around naked flame, leans over to me and tells me that the old men sitting on the wall opposite are ‘challenging’ him and that he has to jump The Chair. I beg him not to. I remind him that we are not religious. He assures me that we are and that the gods are on his side. He jumps. He makes it, no burn marks to be seen. His spirits were cleansed and more spirits consumed. Around 12.30am, the party pumping, 65+ year old Mystic Meg comes out with a huge copper pot covered with a red linen cloth. All the women are told to place something they own into it, and as the story goes, she will reappear later with a poem that predicts your future. The rules – in true Geek style – were complicated, often contradictory and for the group sitting to our left, contained a conspiracy theory or two. Could married women participate? Would you get your things returned to you? Everyone had an opinion but no one could remember the rules from last year. At 1am, the retsina still flowing, Mystic Meg makes a dramatic appearance. Draped in a red satin cape with embroidered gold cross, she climbs up onto a table, microphone in hand and pulls out a large and heavy book of ‘ancient poems’. The first article is pulled out. It’s a silver bangle belonging to Maria from down the road. Maria is summoned and the crowd hushes as her future is predicated. Apparently Maria won’t be shagging the local priest, as his private bits have turned green and have fallen off. LAUGHTER. Everyone is in hysterics. What the hell is going on? According to TS, the book was real. The poems were from ancient times. The poems were rude. Really rude. After the 5th poem, I could hear that they all had the same rhythm; a there once was a man from Nantucket pentameter. Nun’s bits, priests bit, nothing was left sacred. Benny Hill would have been proud. When I asked TS what the recurring word pisiaos was, she just looked at me, rolled her eyes and said, “arse”. I could not believe it. The ruder the better it would seem at Greek Church. I mean, it sure put the post–church cup of tea and scone at Miranda Baptist Church to shame. A church where you can get plastered, recite poetry that includes four letter words and participate in ancient pagan rituals, now that’s something I can sign up for on the most sacred island in Greece. Does Miranda Baptist Church have something to learn from the Greeks? I had no idea about real Greek church! Good for TSH making it over the fire pit….wait, you didn’t share your fortune! Too scared of third degree burns! OMG, that sounds like fun! I’m going to Greece in June and I only HOPE to meet a 65 year old partier! I’ve never had ouzo before, but I imagine it to be the perfect liquid courage for me to jump over fire! Do you have any tips for me? How expensive is it? Thanks! I can’t wait to read them. As a Greek, I couldn’t agree more! June is a perfect choice, with warm weather, yet not so hot as in July and August. The big plus: it is not “high” tourist season and islands are not overcrowded — you can enjoy everything at your leisure! Wow! that sounds amazing and so much fun! Grr… think I lost my previous comment. It looks great and SO much fun! I hate missing comments! It was so much fun, and just so beautiful! I’m so in…..glad to hear you were ready to jump in with your fire extinguisher to save TSH!!! He nearly did need saving!